Friends and Partners for New England for Jesus! 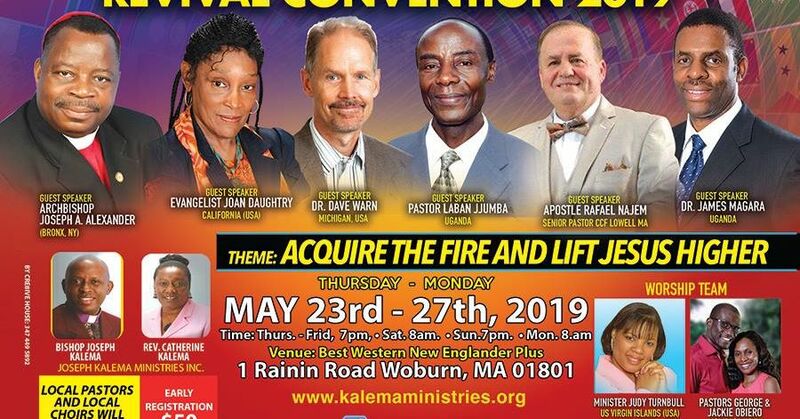 Joseph Kalema Ministries is tasked with spreading the Good News of the Kingdom of God and the Dominion of Jesus Christ to the entire world, starting in New England. As such, we are involved in many activities and outreaches, both at home in the U.S. and abroad. We believe in Unity of the Spirit, as spirit-filled believers.
. . . stay in the place where God has called you to minister, but attend symposiums or leadership training for effectiveness in your calling and gifting.
. . . have access to all meetings we (Joseph Kalema Ministries Inc) conduct nationwide, as you build your prayer group in prayer and intercession.
. . . have the opportunity to be aligned to the spiritual covering of Joseph Kalema Ministries and attend our prophetic prayer expo together with other leaders in strategic praying and Kingdom building, as we restore family prayer altars in our communities. Iron sharpens iron as one man sharpens another. (Proverbs 27:17).
. . . have the opportunity to sow into very fertile ground, as God leads you to give. All donations to Joseph Kalema Ministries are tax deductible. If you have an interest in partnering with us in this work, email us by clicking here. Our 2019 conference has been scheduled. Please check on Special Events for more information.